Ziplining had always been on my bucket list, so upon getting the chance to fly through the air with Costa Azul Extreme Canopy Tour in Cabo San Lucas, I would have been a fool to pass it up! However, that doesn’t necessarily mean I wasn’t nervous. I mean, entrusting a dinky harness and a few cables to hold you up while you soar through the sky several hundred feet above the ground is a pretty marvelous and thrilling accomplishment! But to be honest, it was the thought of rappelling down a 180 ft. cliff that really had me trembling. I get rattled about many things. I’m an adventurer and explorer, but I’m the farthest thing from an adrenaline junkie. I’m just good at talking myself into pushing past the fear. I’m the gal who went scuba diving, but nearly had a panic attack doing so due to claustrophobia. I haven’t always been so daring. Dramatic changes in my life, brought about by the passing of my father and severed relationships created a fearlessness within me. I finally realized I had nothing to lose. I stopped being afraid and started living! It is on this brink of fear and excitement I now thrive, continually seeking the next adventure, and I highly encourage you to do the same. I think many of you can relate to my fears, and by doing something outside of your comfort zone, such as ziplining or rappelling in Cabo, you are manifesting an armor within yourself that only gets stronger. The fact is, you have to face a fear to move past it! 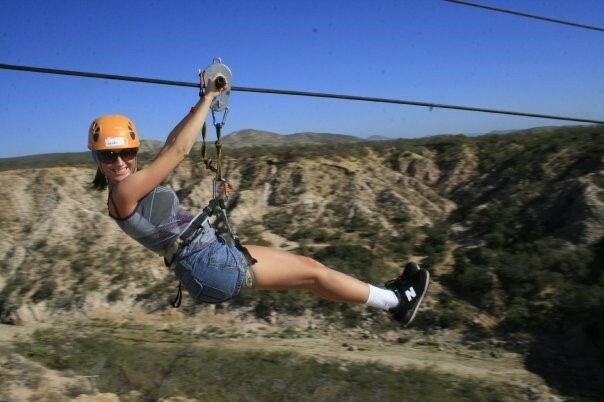 This Cabo tour is wonderful because you also get a chance to go on a crazy suspension bridge, race a fellow zipliner, and have a tequila tasting at the end of it! One would think having the tequila first might make all of this a bit easier, but I suppose they are trying to avoid drunk stumbling into canyon lawsuits. Trust your tour guides! They have done this a few thousand times, know what they are doing, and will ease you into the situation with expert knowledge and many laughs. After I got over the fear of the first zipline, and realized that the harness was extremely stable, I was enthralled and couldn’t get enough. The best part is that you get to navigate through the beautiful Costa Azul mountains in Cabo on 10 different ziplines, all while checking out the impressive desert flora and fauna below. For those of you who are extra fearful, you can do a test run on a much shorter zipline, and work your way up to the longer ones. Be prepared to hike about an hour, with time broken up between ziplines. That means you only walk 5-10 minutes before you stumble upon a new zipline or adventure! Oh, and if you’re wondering whether this is suitable for children, there are many who have participated in this adventure and had a great time! Obviously use your discretion as it will probably depend on how daring your child is. They must be at least 7 years old. Just when I was getting the hang of ziplining, along came the dreaded cliff I was supposed to rappel down. My heart started beating a million miles a minute. It is the initial backwards drop off the cliff that really had me sweating. Well, that and I looked down. Don’t look down! I wasn’t sure if I could go through with it, but I was encouraged to by both my family and the guides. I took a deep breath, let go of control, and finally just DID IT! I even managed to get together a half smile/half terrorized look for the camera. I’m pretty amazed at how skilled I look here actually. I had no idea what I was doing and if there was video you’d see me flopping around the first 5 minutes like a fish out of water. Regardless, I got through it and can now say I have officially rappelled. The feeling I got when I finally reached the ground was incredibly gratifying! After all of that, I was ready to drink some tequila! We finished up the tour by racing each other on ziplines and heading to the tequila tasting that was included. Honestly, I don’t technically drink that much and could not say whether it was the best tequila of my life, but it is always nice to try something different. Then they offered to sell me the pictures they took, which were in all honesty rather expensive, but they don’t allow you to bring cameras so if you want the pictures you have to pay the money. Keep that in mind! We paid over $100 to get all of our group pictures, and prices go up according to the number of people in your group. *Please note that since this trip, I believe the tequila tasting has been cancelled due to the destruction of the tequila room caused by the hurricane in November 2014. Wear/bring sunscreen. Some areas are shaded but you are in the sun often. Bring water! There IS water provided, but bring more just in case! There is a snack bar on site where you can buy food and refreshments afterwards, but otherwise food is NOT included on this tour. In other words, eat beforehand! There are lockers on site to secure valuables. 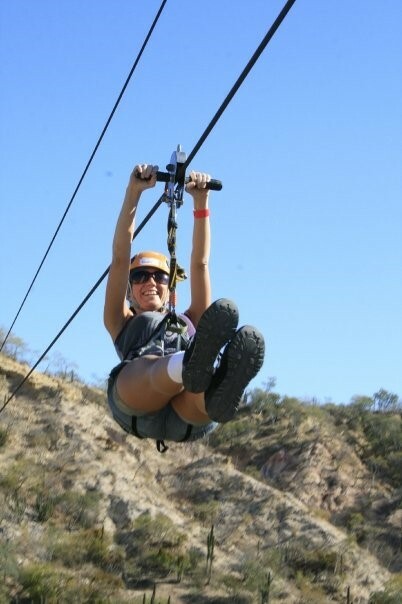 If you’d like more information, check out Cabo Ziplining. They have more specific information including prices, weight requirements, and tour times/availability. 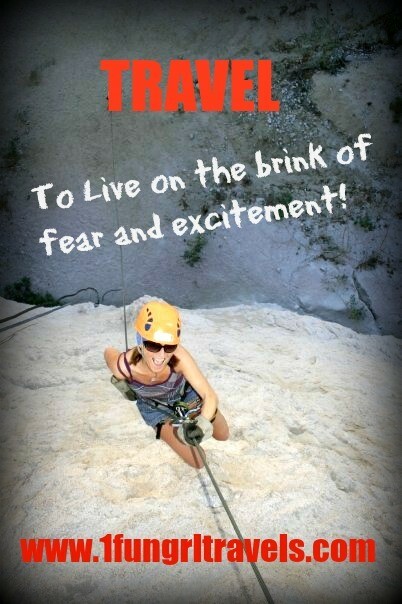 Has a travel adventure conquered one of your fears? Do tell! I think I could do the zip lining but not the rappelling. Good job!